A damp wet week with an easterly wind that has prevailed for more than a month! The wildlife however seems resilient to the damp weather. recent photos and videos below. 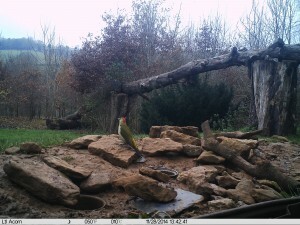 The superbly coloured green woodpecker in the video below. The stag with the wonderful antlers was back last night with lots of followers. 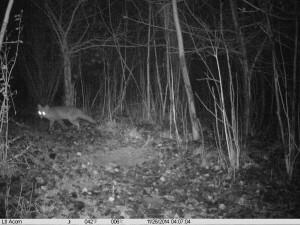 The badgers are emerged by 6pm, the fallow deer are here all day, a video of a lonesome stag gaining some sort of nutrient from a tree root below. The stag was in front of the camera for three hours yesterday part of the time lying down. The herd of fallow deer seen in the video below have been in our wood for the last week, early evening they move out to eat the fallen apples close by our Mobile Home.